Central nervous system (CNS) cryptococcal infection occurs when the encapsulated yeast Cryptococcus neoformans, normally a harmless airway colonizer, infects the CNS space, resulting in meningitis, encephalitis, or meningoencephalitis. Cryptococcus is rarely the cause of serious infection in immunocompetent individuals. However, patients with immune suppression from human immunodeficiency virus (HIV), corticosteroids, organ transplantation, primary immune deficit, or reticuloendothelial malignancy are more susceptible to cryptococcal meningitis. Cryptococcosis is an important fungal infection in patients with HIV, causing 1 million estimated cases and 625,000 deaths from CNS infections worldwide.3 Most cases are caused by C. neoformans; however, C. gattii has emerged in North America and is more commonly the infecting organism in the immunocompetent population.2 Cases of cryptococcosis in HIV-negative/nontransplant patients accounted for 38% of cases at one institution.4 However, most of the HIV-negative/nontransplant patients had other identifiable causes of immunodeficiency.4 HIV-negative/nontransplant patients with cryptococcosis have an increased mortality rate compared to the HIV-positive and transplant recipient groups.4,5 Cryptococcal disease onset is usually insidious, with a 44-day lag between onset of symptoms and diagnosis in HIV-negative/nontransplant patients,4 but the case-specific mortality rate is 27% in this population despite the initial indolent course.5 The period between infection and diagnosis and the polysaccharide capsule shielding the yeast from immune response may be factors in the high mortality rate. 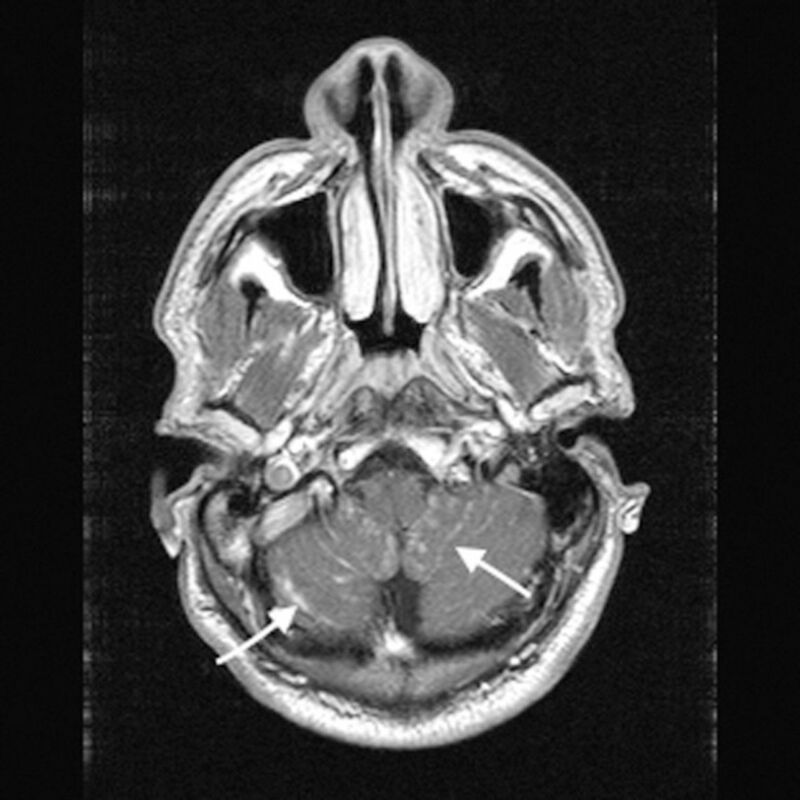 We describe an unusual case of cryptococcal meningoencephalitis involving the brain and cervical spine in an immunocompetent patient. A 34-year-old male with no significant medical history presented as a transfer from an outside hospital for neurology consult for upper extremity weakness and suspected meningitis. The patient's symptoms started with a headache after using an e-cigarette to quit smoking 2 months prior to presentation. He described the headache as constant and diffuse, rated 10/10 in severity. The patient was initially diagnosed at an outside emergency department (ED) with a tension headache and received moderate relief with over-the-counter ibuprofen. The headaches continued, leading to a second presentation at an outside ED. These headaches were suspected to be secondary to nicotine withdrawal, but treatment with nicotine gum further aggravated his headache. One month after the second visit, the patient began experiencing sensitivity to light, odors, and noises. He developed upper extremity weakness, right-sided tinnitus, and ear pain with light noises and presented to an outside ED a third time. He was admitted at the outside hospital and transferred to our institution for a neurology consult. HIV antibody and HIV ribonucleic acid polymerase chain reaction tests were negative, confirming the patient's HIV-negative status. The patient was admitted to our hospital and underwent magnetic resonance imaging (MRI) of the brain without contrast and MRI of the cervical spine. Blood culture 1 day prior to imaging was positive for cryptococcal antigen with a titer >1:256. Lumbar punctures performed the same day and 5 days later showed an increased white blood cell count (92 cells/mm3 with 100% lymphocytes and 80 cells/mm3 with 77% lymphocytes, respectively) and cerebrospinal fluid (CSF) protein. India ink stain and fungal culture of CSF from both lumbar punctures identified no encapsulated organisms and no growth of yeast. The patient received intravenous amphotericin B (5 mg/kg daily) and flucytosine (1,750 mg every 6 hours) for 2 weeks, underwent ventriculoperitoneal shunt placement on hospital admission day 9, and was discharged home on day 18 to complete a 6-week course of 400-mg oral fluconazole daily. No obvious history of exposure to Cryptococcus was identifiable during his stay. The patient reported significant improvement of his symptoms prior to discharge. At 1-week, 1-month, and 3-month follow-up after hospital discharge, the patient showed no clinical signs of infection or neurologic deficit. In the CNS, Cryptococcus infects the CSF and meninges and has a predilection for spreading along perivascular Virchow-Robin spaces. The degree of abnormal contrast enhancement in the brain MRI relates to the ability of the patient to mount an immune response. Immunocompromised patients may exhibit no contrast enhancement with the appearance of dilated high-signal T2 spaces in the basal ganglia regions, described as gelatinous pseudocysts, fungal-filled dilated CSF spaces in the brain. In an immunocompetent patient such as ours, contrast enhancement may be seen along the leptomeningeal surfaces from meningitis (Figures 1-6). Nodular, linear, or ring-enhancing lesions may appear in the deep gray nuclei or hemispheric parenchyma from encephalitis with cryptococcoma formation. Large cryptococcomas commonly masquerade as neoplastic lesions. Infection can extend into and along the surface of the spinal cord, as seen with our patient. Magnetic resonance T1-weighted postcontrast axial image of the upper cervical spine shows leptomeningeal enhancement (arrow) and a possible focal cryptococcal dural implant. 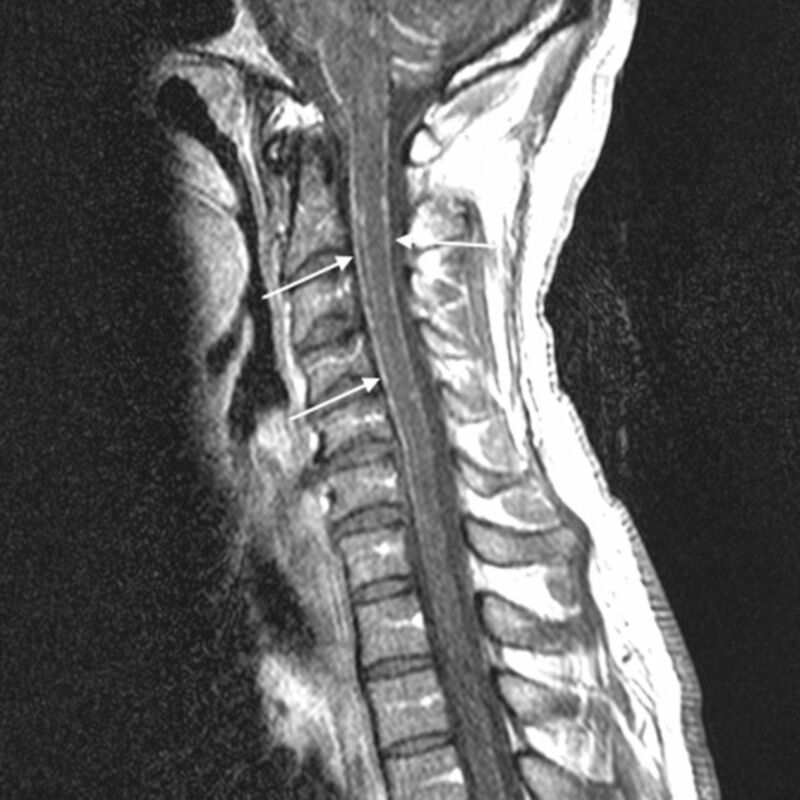 Magnetic resonance T1-weighted postcontrast sagittal image of the cervical spine shows diffuse leptomeningeal enhancement (arrows) related to the spread of cryptococcal meningitis. 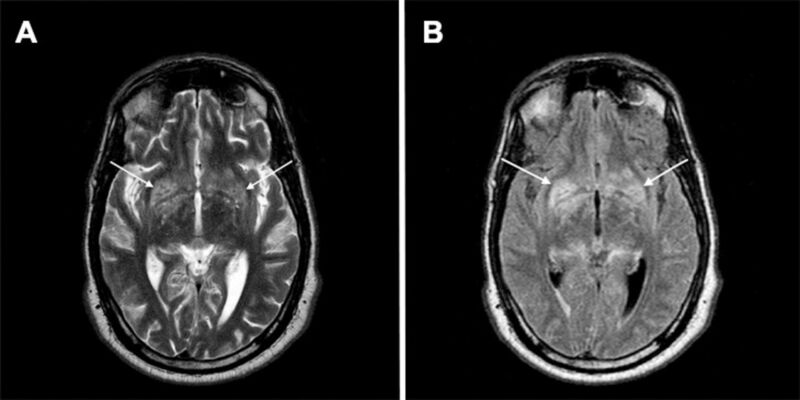 Magnetic resonance T2-weighted axial image (A) and fluid-attenuated inversion recovery axial image (B) of the brain demonstrate intraparenchymal and perivascular T2 hyperintensity (arrows). 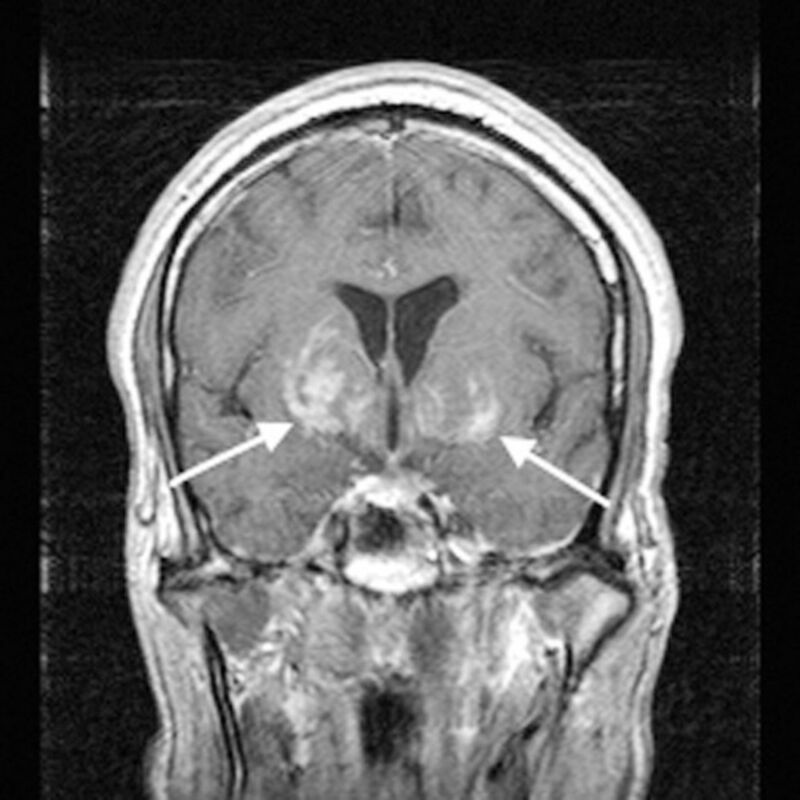 Magnetic resonance T1-weighted postcontrast axial image through the cerebellum shows leptomeningeal enhancement (arrows) along the cerebellar folia. Magnetic resonance T1-weighted postcontrast axial image shows high signal in the basal ganglia bilaterally and thalami with punctate and linear perivascular and parenchymal enhancement (arrows). Magnetic resonance T1-weighted postcontrast coronal image demonstrates linear and nodular enhancement (arrows) in the basal ganglia indicating perivascular and parenchymal cryptococcomas. 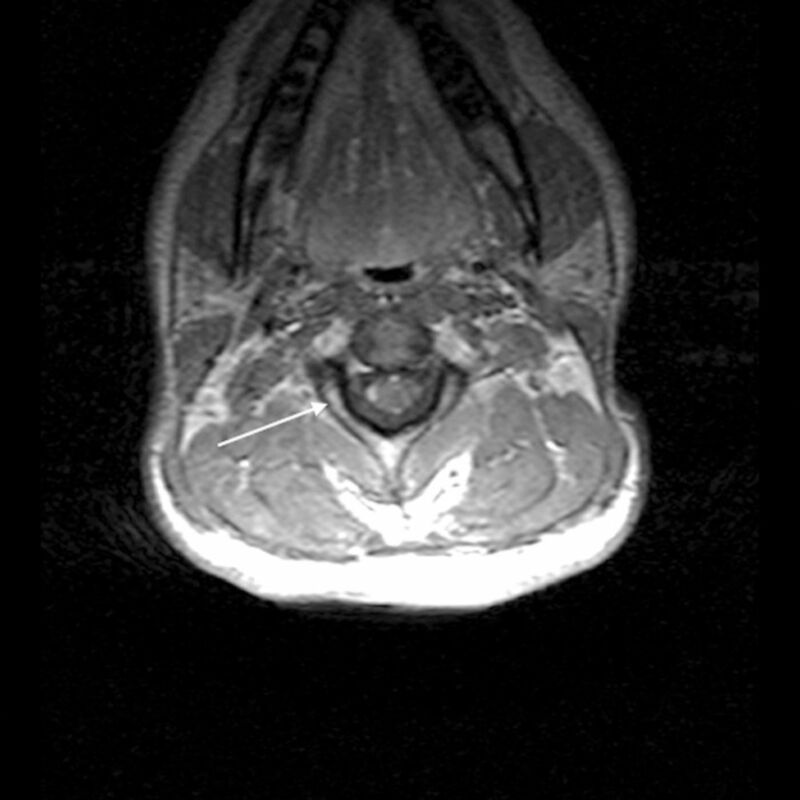 Our patient had extensive leptomeningeal enhancement from meningitis in the head and cervical spinal canal. The numerous linear and nodular enhancing tracts into the deep gray structures indicated spread into perivascular spaces with formation of small cryptococcomas. 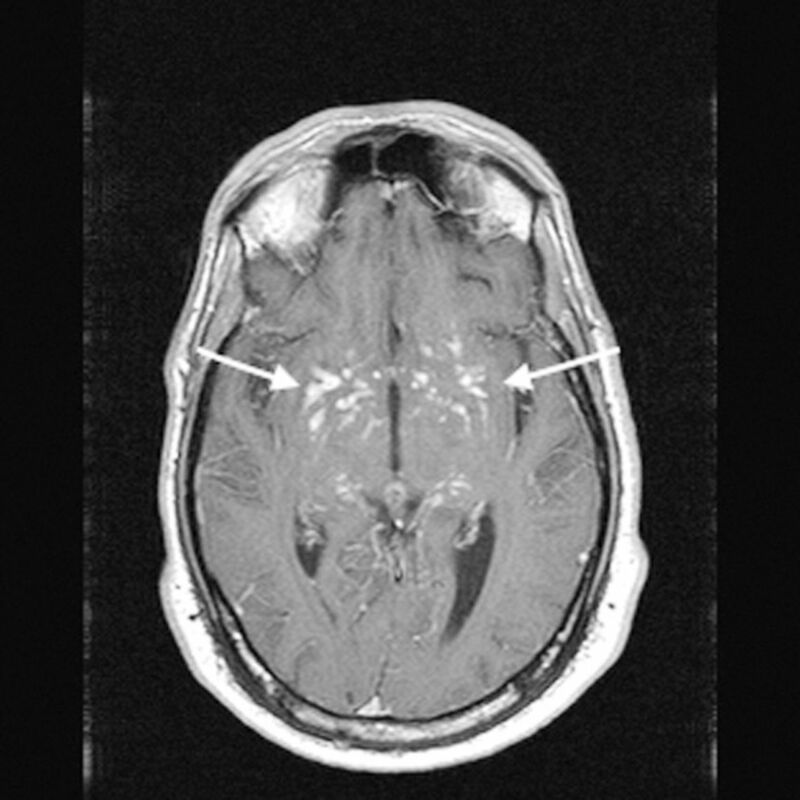 Our patient was immunocompetent and therefore presented with this leptomeningeal pattern of contrast enhancement, a pattern that is uncommon in immunocompromised patients. In their practice guidelines, Tunkel and colleagues suggest that any patient who is immunosuppressed or has focal neurologic signs, seizure, or papilledema should receive CNS imaging before lumbar puncture.7 Most immunocompromised patients with concern for cryptococcal infection have focal neurologic symptoms, so computed tomography (CT) is commonly the initial evaluation. Further workup includes lumbar puncture and CSF fungal culture that may take weeks to return, serum antigen test with lower prognostic value, and India ink stain of CSF. After initial lumbar puncture, CT imaging, and CSF and serum laboratory studies, diagnosis of fungal meningitis may remain uncertain. Antifungals are the primary treatment for cryptococcosis. Susceptibility to amphotericin B and flucytosine for induction treatment is presumed. Duration of induction treatment is at least 2 weeks with daily monitoring of electrolytes for amphotericin-induced abnormalities. Secondary treatment with at least 8 weeks of fluconazole following primary treatment is recommended by the Infectious Diseases Society of America guidelines.8 One study showed that adjuvant therapy with interferon gamma-1b produced sterilization of the CSF more quickly than treatment without interferon gamma-1b and may be helpful for prolonged or refractory disease.9 These findings have led to a recommendation to use interferon gamma-1b as an adjuvant treatment in refractory cases in both immunocompetent and immunocompromised patients.8 A 2017 case series evaluated postinfectious cryptococcal spinal arachnoiditis in immunocompetent patients and suggested that a postinfectious inflammatory response syndrome may be involved in patients with continuing symptoms.10 The case series showed promising results for the use of pulse corticosteroids. Imaging, in conjunction with history and physical examination, can help differentiate fungal meningoencephalitis from other disease and guide treatment more quickly than many conventional studies if performed according to American College of Radiology Appropriateness Criteria.11 The use of imaging may decrease the delay from onset of symptoms to time of diagnosis in immunocompetent patients and subsequently lead to improved patient outcomes. While cryptococcosis is typically considered a disease of the immunocompromised population, it is becoming more recognized in the immunocompetent population. However, the relative paucity of cases of cryptococcal meningoencephalitis in immunocompetent patients makes tailoring treatment to this population difficult. Further research is needed to improve the outcomes of immunocompetent patients with cryptococcosis. Comparison and temporal trends of three groups with cryptococcosis: HIV-infected, solid organ transplant, and HIV-negative/non-transplant. PLoS One. 2012; 7(8):e43582. doi: 10.1371/journal.pone.0043582. Erratum in: PLoS One. 2012; 7 10 doi: 10.1371/annotation/a94bc542-6682-4579-a315-57019cef7e0e. Appropriateness Criteria. American College of Radiology. https://acsearch.acr.org/list. Accessed February 10, 2017.